Seven months have passed since I introduced you to Stretch (my made-up name) and his littermate in March 22, 2016 post “Here, Kitty, Kitty“, documenting several feline sightings on North Ave.—if I rightly recall between Madison and Adams. He hissed when approached, so I never got close. I shot the pic at 6:09 PST, about 50 minutes before sunset but with buildings and horizon already blocking light, using Fujifilm X-T1 and Fujinon XF35mmF2 R WR lens. The camera offers dials for all major settings, including ISO, which I manually set to 200. Other vitals: f/2, 1/1900 sec, 35mm. I edited the RAW original in Adobe Photoshop Lightroom, tweaking Clarity and Highlights. This pic appears in the earlier post cropped 1:1. The reedited Feature Image is recropped to 16:9, and I let the software auto-adjust White Balance to 4,150k from 5,000k. 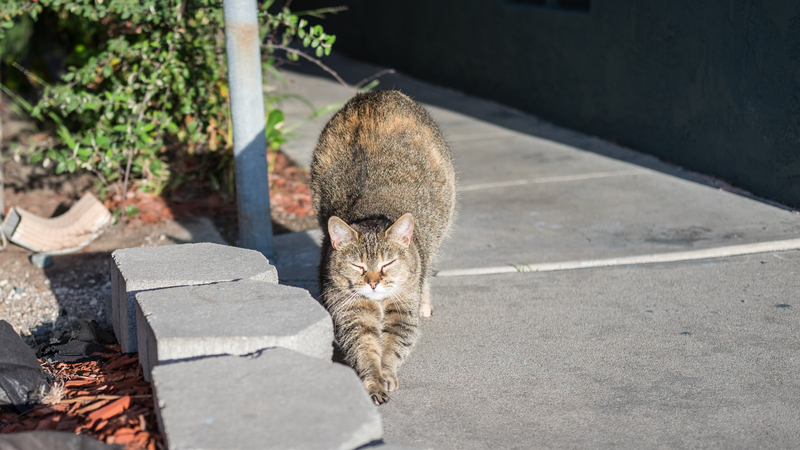 Stretch is the tenth cat in this series. The others: Scruffy, Roly Poly, Woo, Skull, Biscuit, The Colonel, White, Chipper, and Frisky.